After trying the nigiri omakase at Maumi, I went for a nigiri omakase at Maruyama to compare the two. I needed all the fancy sushi I could get to refuel myself before the start of the fall semester. Plus, there's hardly anything wiser to do than breaking the bank just before I have to pay tuition. 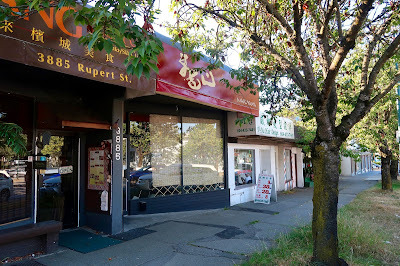 I first learned about Maruyama through a recommendation from Grayelf, one of Vancouver's most knowledgeable foodies. She had had a few great experiences there, so I thought it would be most fitting for the two of us to go together since she would have the best insights regarding what to order. 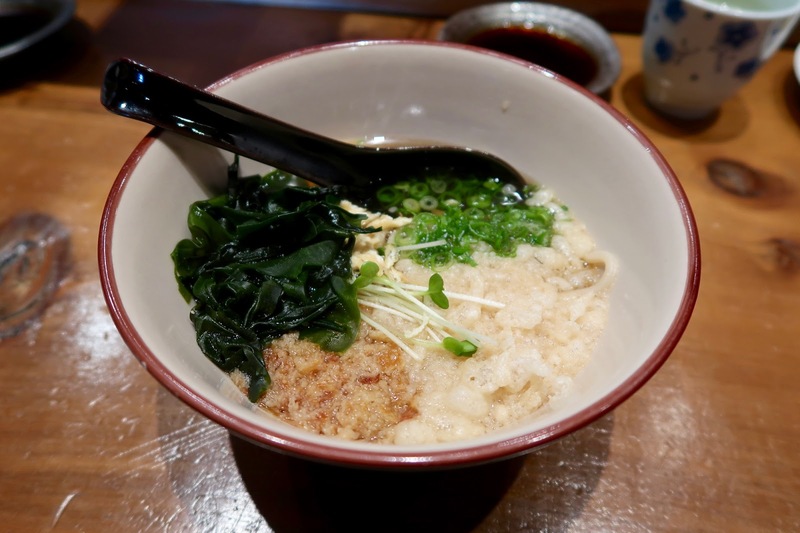 The master at Maruyama is Chef Yoshiya Maruyama, who previously worked at Blue Water Cafe in Yaletown. Maruyama does not quite have the elaborate, elegant ambiance that Blue Water Cafe does, but the atmosphere could still be described as classy. Chef Maruyama's height may be a bit intimidating, but he is very friendly. At the bar, we conversed about various topics ranging from the habitats of particular kinds of seafood to his experiences at other nearby omakase restaurants. Grayelf and I wanted to try his best selection of sushi, but since neither of us cared much about uni, we opted for the $60 ten-piece premium omakase. 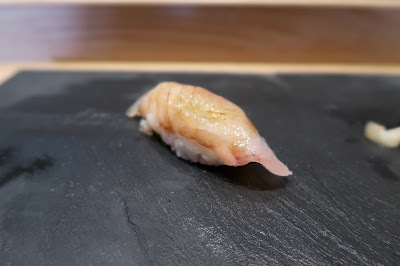 Our omakase commenced with the Hirame Nigiri (fluke). The fluke had a pleasant sweet flavour, though the application of wasabi was a little too heavy for me. The sushi rice was decent here, but not made with utmost precision until around the third or fourth piece. 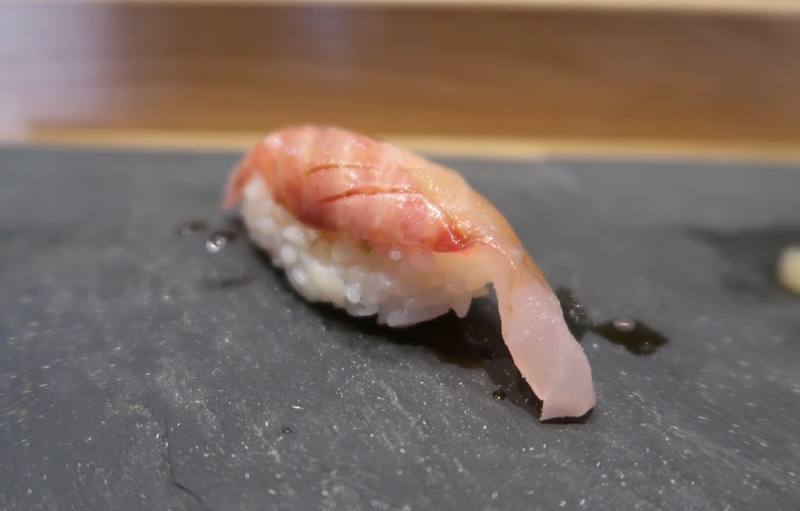 Our next piece, the Isaki Nigiri (three-line grunt), had a richer flavour than the Hirame and a very smooth texture. 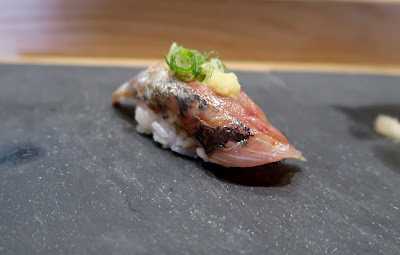 With the Aji Nigiri (horse mackerel), I enjoyed the addition of grated ginger and green onion, which provided a nice zing to the nigiri and helped to balance out any fishiness with the aji. The aji itself had a nice, rich flavour. The Kuro Dai Nigiri (black sea bream) had a bouncy chewiness and a rich sweetness, along with a very smooth texture. The wasabi was once again a little heavy here. The Madai Nigiri (sea bream) had a sweet, scallop-like flavour. By this point, the sushi rice and the balance of wasabi were excellent with every piece. 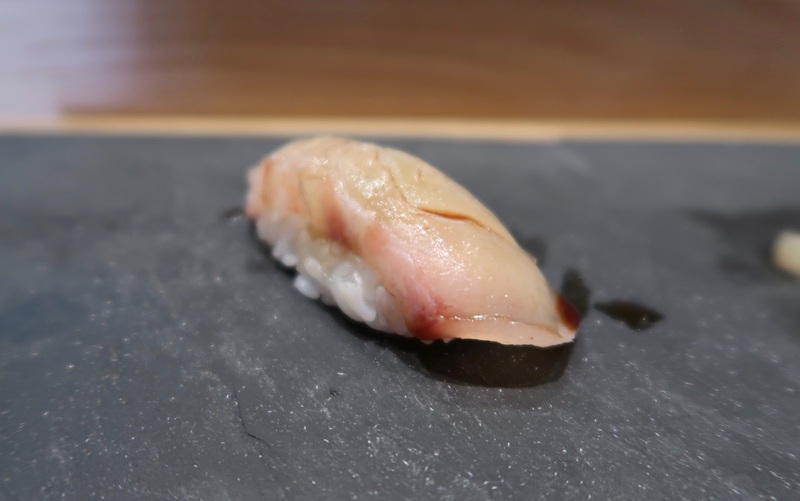 The Mejina Nigiri (large-scale blackfish) had a chewier, meatier texture. Freshness was very apparent with this one. Slightly milder in flavour was the Kin Medai Nigiri (premium red snapper), which had a slight chew. 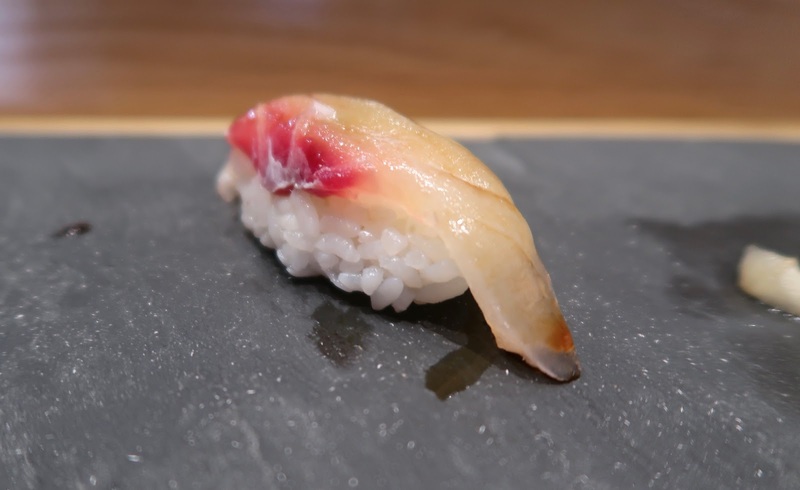 Looking closely at the nigiri, you can see the red scales of the snapper. One piece that really hit the target for us was the Itoyori Nigiri (golden threadfin bream). 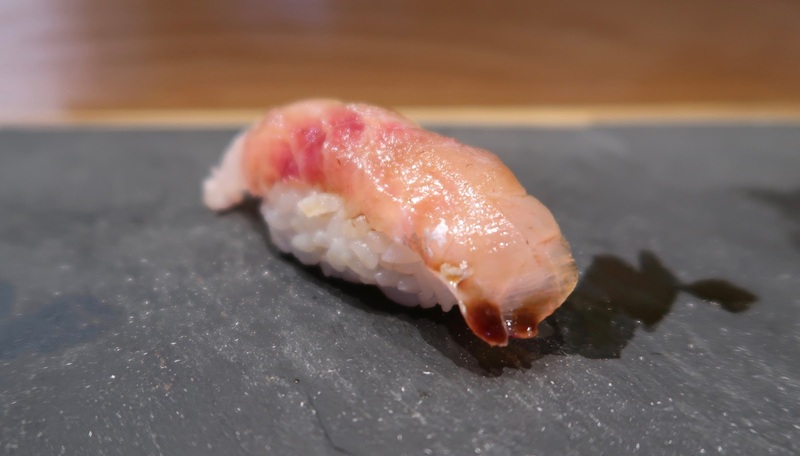 With an extremely soft and melty texture, this piece of nigiri was so delicate that it almost fell apart when I tried to pick it up. A slight hit of wasabi (no overage of it this time) perfectly complemented the rich flavour of the itoyori. 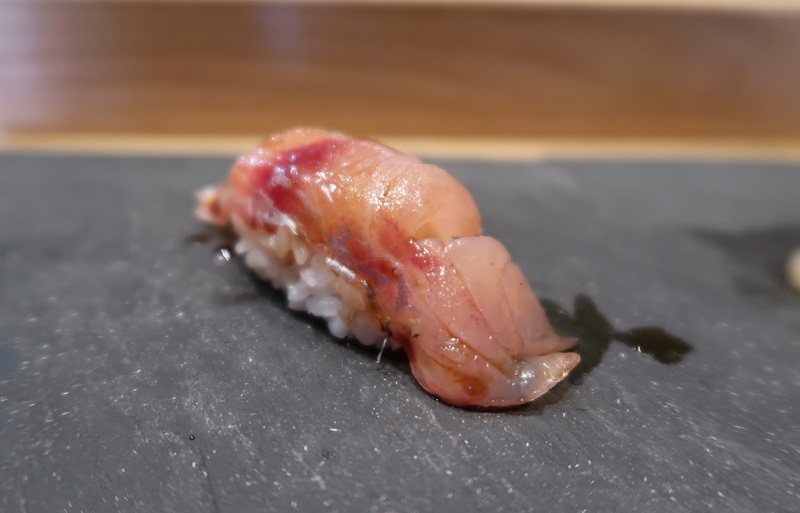 In comparison, the Renkodai Nigiri (yellowback sea bream) had a milder flavour. A lighter application of wasabi was used to accommodate for this. 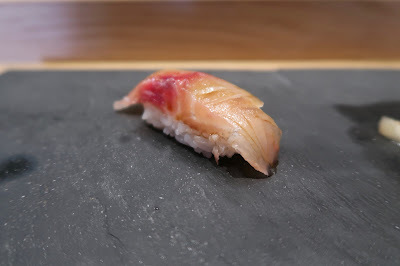 The finale of our nigiri omakase was a piece of Bluefin Otoro Nigiri. At $15 a piece (if ordered separately), this broke the record for the most expensive piece of nigiri I have ever had. Just five years ago, I would think that $2 for a piece of nigiri was too much. How times have changed! However, the price was justified as the bluefin otoro exhibited a fantastic, marbly texture. It produced the perfect umami explosion when placed in your mouth. I will say without hesitation that this was the best piece of bluefin otoro that I have had so far. Due to sustainability issues, I expect this to be the last piece of bluefin tuna I have this year, unless it is served to me as part of a nigiri/sashimi set. Of course, ten pieces of nigiri would never make me full, so I asked for Grayelf's advice on some other dishes to get. We ended up getting the Organic Eggplant Agedashi and the Premium Homemade Udon. The Organic Eggplant Agedashi came with several small, cute pieces of eggplant with a debatably appropriate appearance. 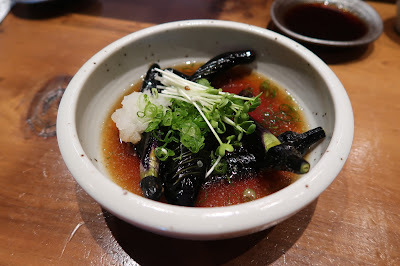 Graced with daikon and green onion, the eggplant was very juicy and absorbed the flavour of the broth well. They cleverly made many incisions into the sides of the eggplant to make it much easier to chew. Upon hearing that Grayelf and I wanted to split the Premium Homemade Udon, the staff offered to the split the udon between the two of us. The udon noodles were much thinner than regular udon noodles but still had a good amount of chewiness. The daikon, kombu (seaweed), and bean curd all complemented each other nicely. Deep-fried crumbs added savouriness to the udon, but also made the udon broth a little too strong and greasy flavour-wise. We received professional and friendly service from both Chef Maruyama and the staff. Quality and careful preparation were apparent in every dish. 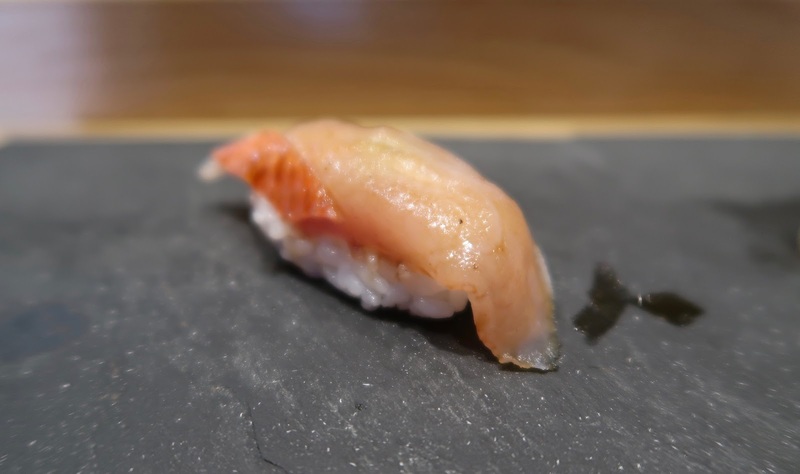 I found the consistency of the nigiri omakase here to be better than what I had at Sushi Bar Maumi. 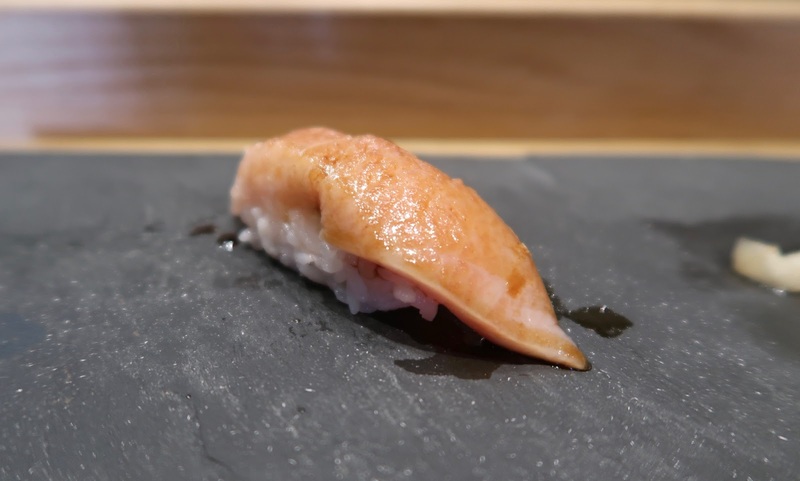 However, Sushi Bar Maumi's omakase is cheaper and offers more variety. If you have wise spending habits like me and allocate a lot of your expenses towards sushi, I would say that both Sushi Bar Maumi and Maruyama are worth visiting. great post! you can call it a seabream omakase :P He sliced the fish in front of you right? Thanks Picky Diner! Yeah, there was a lot of sea bream and sea bream-like fish served in the omakase. I wished for a little more variety, though I can't complain about the quality. Fish was cut in front of us, unlike Sushi Bar Maumi.